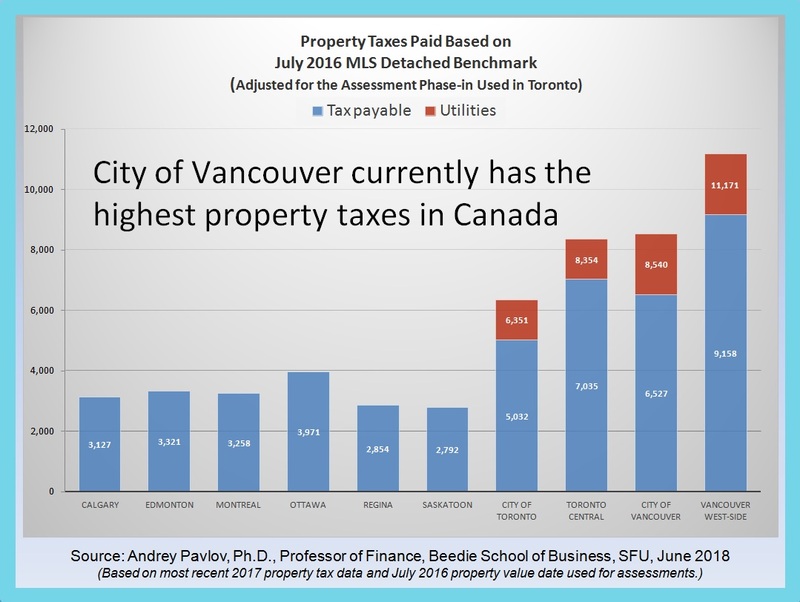 Property taxes in the City of Vancouver are the highest in Canada, and if the proposed school-tax surcharge is added, it increases the amount substantially more, says Elizabeth Murphy, former property development officer for the city. The proposed B.C. school-tax property surcharge has nothing to do with funding schools since it just goes into provincial general revenue and has no relation to a mill rate. This would be beyond the hundreds-of-millions of dollars B.C. already collects under the current school tax above the Vancouver school board’s budget that subsidizes the rest of the province. This will leave little room for municipalities to raise necessary funding for municipal services since property taxes are their primary source of revenue. The municipalities with the highest property taxes like Vancouver and Toronto are also the cities with the most growth. Property taxes subsidize growth since only 10 per cent of the costs of growth are covered by development fees. Municipalities across the region are raising concerns about B.C. encroachment into their municipal tax base. Several have made inquires to the minister of finance, such as the District of West Vancouver, Richmond and Surrey. Implementing unaffordable taxes on unrealized capital gains that are unrelated to the ability to pay is against the principles of the Canadian tax system. Deferral isn’t justification. Not everyone qualifies for deferral and these programs may not be available or substantially restricted in future. Deferral doesn’t apply on rental properties of three units and less, only on principal residences. Only rentals of four units and more are excluded from the surtax. So this means that owners of smaller rental buildings, which affects tens-of-thousands of rental units, would be driven to either try to recover this additional tax burden from rents, go into debt or sell. Many houses, especially in Kitsilano, have been converted to three-rental units or may have even more units that won’t be exempted if some units are unauthorized. These rentals could be caught by this surtax without the option of deferral. It’s not accurate to assume that assessed value reflects either the owner’s ability to pay or the amount of equity they may have in their property. Even detached properties that have been owned for a long time may carry large loans for many legitimate reasons. Banks have different criteria and many people may not qualify for their financing with an increased tax burden. This is really about neighbourhood clearing. It’s a predatory policy that benefits those who buy on speculation to assemble, develop or flip since property taxes are only paid for a short period of time and are the cost of doing business. Whereas a long-term homeowner would be paying year-after-year and these kinds of unaffordable taxes make ownership prohibitive to all but those with high incomes, even if they bought a long time ago. 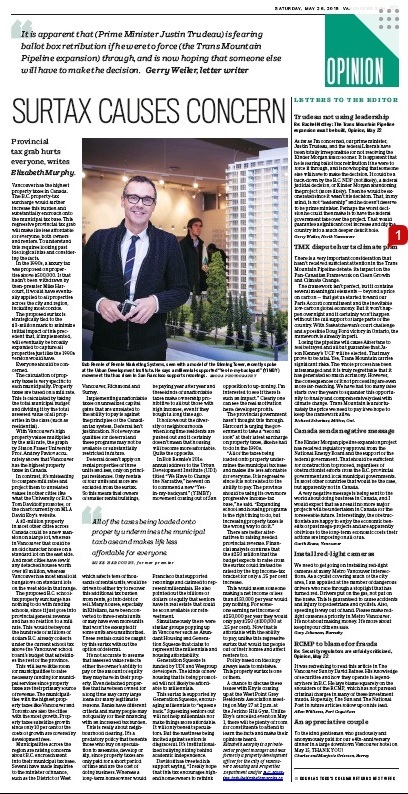 It hollows out the diversity of neighbourhoods when longtime residents are pushed out and it certainly doesn’t mean that housing will become more affordable. Quite the opposite. In Bob Rennie’s 2016 annual address to the Urban Development Institute (UDI) titled “We Have to Change the Narrative,” he went on to commend a new “Yes-in-my-backyard” (YIMBY) movement coming out of San Francisco that supported rezonings and claimed to represent millennials. He also pointed out the billions-of-dollars of equity that seniors have in real estate that could be soon available for reinvestment. Simultaneously there were similar groups popping up in Vancouver such as Abundant Housing and Generation Squeeze that claim to represent the millennials and housing affordability. Generation Squeeze is funded by UDI and Wesgroup developers. The kinds of new housing that is being promoted will not likely be affordable to millennials. This surtax is supported by Generation Squeeze, encouraging millennials to “squeeze back.” Squeezing seniors out will not help millennials nor make things more affordable. It will only benefit speculators. But the nastiness being incited against seniors is disgraceful. It’s institutionalized bullying hiding behind academic independence. Davidoff has tweeted his support saying, “I really hope that this tax encourages high-end homeowners to rethink opposition to up-zoning. I’m interested to see if there is such an impact.” Clearly one can see the real motivation here: developer profits. The provincial government hasn’t thought this through. Harcourt is urging the government to take a “second look” at their latest surcharge on property taxes, like he had to do in the 1990s. There are better alternatives to raising needed provincial revenue. Financial analysis confirms that the $250 million that the budget expects to raise from the surtax could instead be raised by the top income-tax bracket for only a .25-per-cent increase. This would mean someone making a net income of less than $150,000 per year would pay nothing. For someone earning net income of $250,000 per year they would only pay $250 ($100,000 at .25 per cent). Now that is affordable with the ability to pay, unlike this regressive surtax that would tax people out of their homes and affect renters too. Policy based on ideology always leads to mistakes. This property surtax is one of them. A chance to discuss these issues with Eby is coming up at the West Point Grey Residents Association meeting on May 27 at 2 p.m. at the Jericho Hill Gym. Unlike Eby’s cancelled event on May 1, there will be plenty of room for constituents to attend to learn the facts and make their opinions heard.